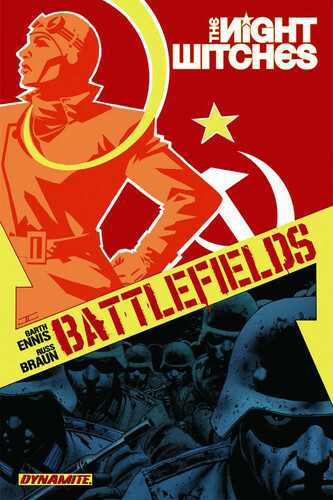 The Night Witches is the first of three, three-issue historical-fiction comics that Garth Ennis has written for his “Battlefields” series. Published by Dynamite Entertainment, The Night Witches features Russ Braun on page-to-page art, with cover art by John Cassaday and Gary Leach. The Night Witches is primarily the story of the 599th Night Bomber Regiment; a squadron of all-female fighter pilots in the Soviet Air Force during World War II. Though the comic’s story is fiction, it’s inspired by the actual, all-female Soviet 588th Night Bomber Regiment, dubbed by the German army as Night Witches. This name was earned because of their nightly harassment missions on the German front lines in mere Soviet Po-2 biplanes. They would cut their engines and silently swoop in on German ground forces. This technique made it very hard for them to be detected in time to be shot down. As I said, The Night Witches is primarily about the female pilots, but there is also a sub-plot which focuses on a single squad of German infantry whom are continually harassed by the Night Witches. While the main character on the Soviet end of things is Anna Kharkova, her co-star in the German trenches is Kurt Graf. Each side of the story is narrated by their respective main character, with a page-time ratio of about 2:1, though both stories intersect with each other throughout. Up to this point, based on my posts here at Downloadable Suicide, you may have pegged my favorite comics writer as being Jonathan Hickman. That would be a good guess, but you would be wrong. In fact, it’s Garth Ennis. He’s the one man in comics whom everyone seems to have an opinion on; they love him or hate him, or are simply too squeamish to read his work to begin with. I’m in the “love him” camp. Ennis’ early work was ground-breaking and extremely important to the freedom of creative expression in comics. I could go on about how he writes Frank Castle like no other, but this isn’t the time. I have not done a post on a Garth Ennis comic yet because no recent releases have seemed approachable enough. He’s the busiest writer in comics, perhaps second only to Warren Ellis, but I was waiting for something to come out that would be appropriate for first-time Ennis readers and old fans alike. I think The Night Witches is it. I don’t think you’ll have a hard time finding individual issues of The Night Witches, as there are only three. eBay, Sci-Fi Genre or MyComicShop.com should have you covered on those. If you’d rather pick up a trade paperback, one will be coming out on February 25th which features a “making of the series” by the artist, Russ Braun. A five-page preview of issue #1 can be found at Comic Book Resources.